If you have any questions about the SEAQUEST information page below please contact us. The motor yacht SEAQUEST is a superyacht of large proportions. This 50 m (164 ft) luxury yacht was begun and finished by Westport Shipyard in 2008. Superyacht SEAQUEST is a well designed yacht that can sleep as many as 16 guests on board and has approximately 12 crew members. The firm of naval architecture that made the design work in respect of the yacht was William Garden and Westport. Donald Starkey Designs was the one who saw out the overall interior design. The yacht's general design work came from William Garden and Westport. The formal naval architect firm plans are a creation of William Garden. Motor Yacht SEAQUEST received her elegant interior designing from the interior design office of Donald Starkey Designs. Created by Westport Shipyard this yacht was constructed in the yacht producing country of the United States. She was officially launched in Port Angeles Wa in 2008 before being transferred to the owner. The core hull was built out of composite. The motor yacht superstructure is fabricated extensively with composite. With a beam of 9.4 metres / 30.9 ft SEAQUEST has spacious interior. A reasonably shallow draught of 2.4m (7.9ft) affects the amount of overall harbours she can enter, depending on their individual depth at low tide. The yacht makes use of twin powerful MTU main engine(s) and can reach a exhilaratory maximum continuous speed at 24 knots. The engine of the ship gives 3650 horse power (or 1678 kilowatts). Her total HP is 4560 HP and her total Kilowatts are 3356. She is driven by twin screw propellers. SEAQUEST has a/an quick cruise speed is 20 knots which enables a range of 5200. With space for a maximum of 16 yacht guests spending the night, the SEAQUEST accommodates them luxuriously. Normally the vessel utilises approximately 12 proficient crew members to operate. In October 2009 SEAQUEST traveled to Noank, in United States. This motor yacht also traveled the area including New London County during the month of Sept 2009. This motor yacht has a teak deck. 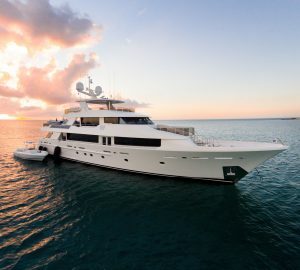 The luxury yacht SEAQUEST displayed on this page is merely informational and she is not necessarily available for yacht charter or for sale, nor is she represented or marketed in anyway by CharterWorld. This web page and the superyacht information contained herein is not contractual. All yacht specifications and informations are displayed in good faith but CharterWorld does not warrant or assume any legal liability or responsibility for the current accuracy, completeness, validity, or usefulness of any superyacht information and/or images displayed. All boat information is subject to change without prior notice and may not be current.